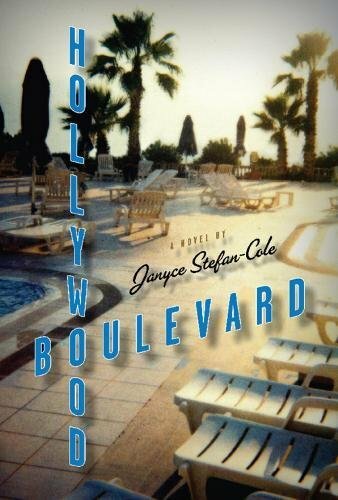 Hollywood Boulevard is a meandering novel that spends much of its time exploring the mind and existential angst of its narrator, a [SPOILER AERT] temporarily paused movie actress named Ardennes Thrush. The storytelling meanders even though the tale takes place in a fairly confined geographical area, including a few days in a space not much larger than a prison cell. The first half of the work has a choppy and almost cluttered feeling; nonetheless, in general Ms. Stefan-Cole has a writing style that is clear and flowing—but seldom exciting. The author doesn’t find her consistent stride until she is almost halfway through her 340-page work. We spend a lot of the earlier time in the actress’s head as she bounces between thoughts of her late father, her paused career, her ex-husband, her current husband, her neighbors, a possible stalker, a casual affair, and the story of another actress who may or may not have died in the same fading hotel where Ardennes lives while her movie director husband works on his latest film. If this review sounds disjointed, it is. In fact, one could accuse the narrator of babbling aimlessly through many of the pages. Self-exploration and self-discovery are excellent topics for a novel. Unfortunately, the protagonist/narrator’s journey stays close enough to the surface to appear more like self-absorption. Hollywood Boulevard is sometimes a mystery, sometimes a romance, and sometimes a morality play. Of course, all these elements can be blended to create a compelling story, but in this book, the reader is left with the feeling that the author needed to stir the pot a few more times to make the mixture coalesce. Many of the digressions are not well integrated and feel like padding. The characters are often put into situations that, in spite of the author’s explanations, are illogical and unrealistic. For example, it is difficult to believe that misplaced good will, inertia, and an intimate relationship with a police detective are sufficient explanations for fairly serious crimes going unreported or covered up. Flaws aside, Ms. Stefan-Cole’s book contains numerous entertaining moments. Such detective novel gems as, “Hollywood develops amnesia faster than a corpse forgets to breathe,” and poetic images of a Los Angeles downpour that clears both the L.A. smog and the narrator’s mental fog, remind us that the author is a nonetheless one to be reckoned with. Janyce Stefan-Cole may not have had a tight hold on the reins in this novel, but there are numerous implied promises that there are stronger works waiting to roll off her keyboard.